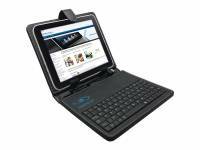 Affordable keyboard case for Trekstor Surftab ventos 8.0. The cover is made from PU Leather with built-in QWERTY keyboard. Colour Black. Order online at 123BestDeal!